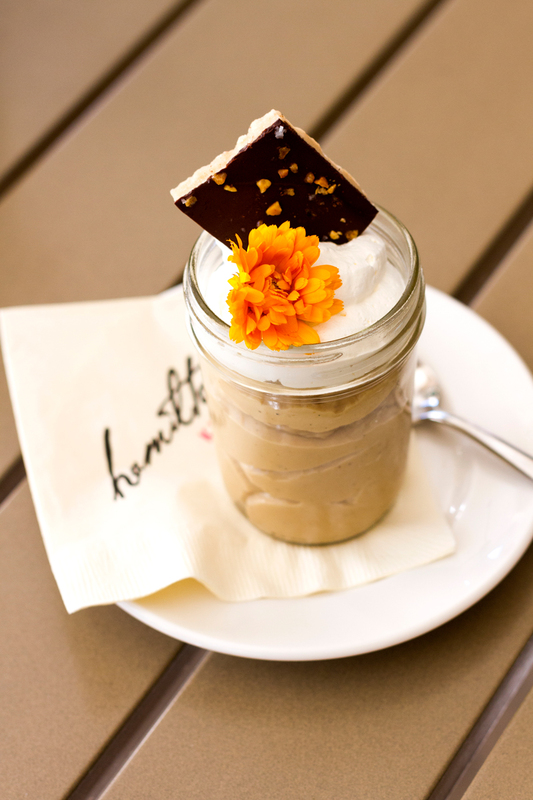 The Macallan 12-year butterscotch pudding with salted toffee brittle and whipped cream has been a house specialty since Hamilton’s Kitchen opened five years ago. Most of us begin having “who am I?” moments during adolescence. We determine what sort of people we aspire to become, then adapt our appearances, hobbies, vocations and habits accordingly. At five years old, Hamilton’s Kitchen is at a similar crossroads. The restaurant debuted along with the award-winning Alfond Inn, the art-filled boutique hotel in which it’s located. Rollins College owns the much-lauded Alfond, which was recently ranked No. 2 in Florida during the Condé Nast Traveler Readers’ Choice Awards. Not long after, in an article entitled “The Soul of the Swanky South,” Winter Park Magazine described Hamilton’s Kitchen as “Modern Southern” and reported on the chef’s goal of making the indoor-outdoor space with an open kitchen appealing not only to lodgers but to the entire community. The restaurant remains a Winter Park favorite. The décor is hearty and warm — call it polished-rustic — although the artwork in the lobby and behind the restaurant’s reception stand is different because the college’s Cornell Fine Arts Museum swaps pieces periodically. Certain classics remain on the Hamilton’s Kitchen menu, and the Modern-Southern ambiance continues to permeate. Still, today’s culinary team is in the process of redefining the restaurant without losing its core competencies. Chef Stephen Doyle, who joined Hamilton’s in July 2017, and Assistant General Manager Christopher Giannone, who has been with the hotel since its opening in August 2013, are the masterminds. You may have enjoyed Doyle’s food before. His resumé includes lengthy stints at Healthy Chef Creations, Church Street Station and the historic Tap Room at Dubsdread. 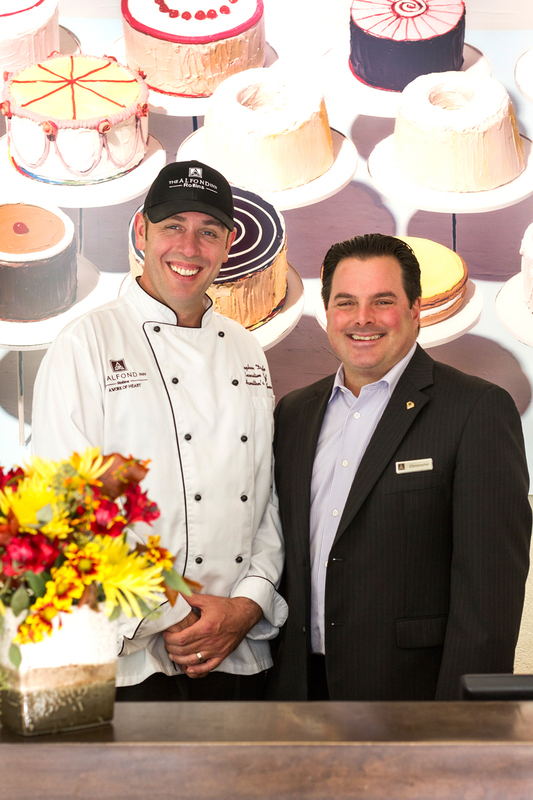 Chef Stephen Doyle (left), who joined the culinary team in July 2017, and Assistant General Manager Christopher Giannone (right), who has been with the hotel since its opening in August 2013, are tweaking the Hamilton’s Kitchen menu, adding new items and keeping old favorites. Still, the first new dish he describes sounds mighty hearty. It’s a braised Moroccan lamb shank with a chickpea stew that takes 36 hours to prepare from start to finish. The substantial entrée is most certainly not Southern, Floridian nor Caribbean. Sounds tasty, though. I can personally attest to the veal porterhouse with a porcini-cabernet sauce. The veal, a lovely slab of meat — Hamilton’s Kitchen is one of only a handful of places where you can get veal for dinner in this town — is served over just-tender baby carrots. Alongside is a curly whipped mound of Colcannon mashed potatoes, an Irish specialty laced with kale, bacon and onion. Did I eat every bit of it? Oh, yes. And did I quibble that the dish wasn’t particularly reminiscent of the South, the Caribbean or the Sunshine State – or low in fat? Oh, no. Carnivores will be pleased to learn that Doyle and Giannone are excited about their ventures into “more unique meats,” including beef aged on the premises for one to two months, and Kurobuta pork. They’re also always on the lookout for what Doyle calls “the next newest coolest thing.” An example is Maple Blis — technically Blis bourbon-barrel-aged maple syrup — which is so much better than maple syrup that it’s an injustice to refer to it by its generic name, they say. Maple Blis is added sparingly to select dishes. “We want to cook with the right ingredients, serve them on a beautiful plate, allow the natural colors to do the work and not add much in terms of sauce painting,” Doyle notes. Let’s not focus on culinary boundaries, particularly since Doyle doesn’t. Let’s instead take Hamilton’s Kitchen for what it is — an eclectic restaurant that doesn’t fit neatly into a single niche — and then talk about what’s coming up. I’d say, overall, that it’s an inviting place with a menu that’s familiar enough to appeal to timid eaters and sufficiently creative to attract culinary adventurers. Most appetizers are on the familiar side: a cheese board, a shrimp cocktail and a Caesar salad — albeit with brioche croutons — and a house-made dressing. Being daring, though, we opted for a trio of cranberry-walnut-goat cheese truffles atop a smear of black garlic, and an order of tuna tartare. The chopped raw tuna, with its avocado accompaniment and soy glaze, was a fresh, flavorful starter adorned with a “chip” of fried salmon skin. 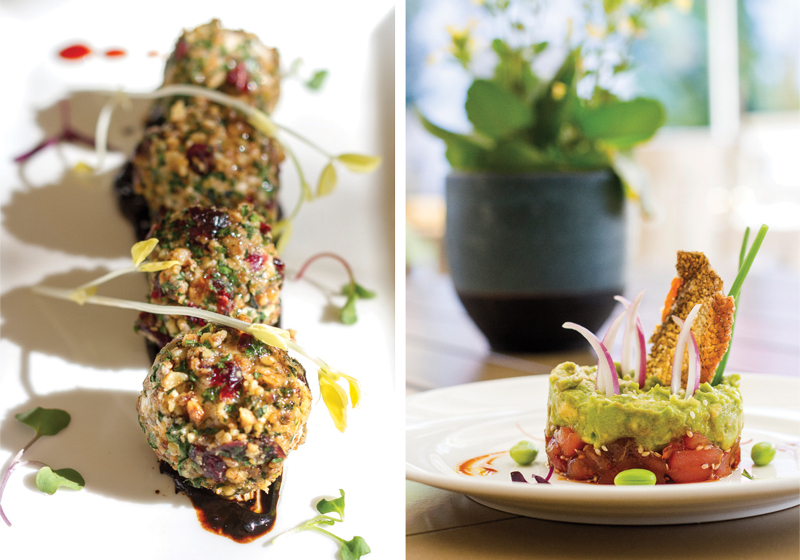 Starters include cranberry-walnut-goat cheese truffles atop a smear of black garlic (above left), and tuna tartare with avocado and soy glaze accompanied by a “chip” of fried salmon skin (above right). Besides the veal porterhouse, my dining companion and I opted for the lemon-sage chicken butternut gnocchi. The orbs themselves are made in the kitchen from potatoes and squash — which must be quite a labor-intensive job. The gnocchi is tossed with heirloom tomatoes, portobello mushrooms and petite spinach, then topped with tender lemony skin-on chicken and laced in an herb-butter sauce. Walnut-crusted halibut, cashew-crusted grouper and crispy duck with a blackberry element are among the other offerings. At my table, we added an asiago risotto with asparagus just so we could try it. After sprinkling on a dash of salt, we enjoyed the creamy, cheesy taste. That left me with the Macallan 12-year butterscotch pudding, which has been a house specialty since Hamilton’s Kitchen opened. I remember the dessert looking more impressive than the pale confection in a mason jar that showed up at our table. Still, the creamy, spirited pudding with salted toffee brittle and whipped cream wows me every time I indulge. No wonder it remains on the menu no matter who’s running the kitchen. “I’d die in a bathtub of that pudding,” Doyle says. So obviously it’s not going anywhere under his watch. A restaurant isn’t only about food, of course. Which brings us to wine. At Hamilton’s Kitchen, the wine list focuses on small-batch and family wineries in Sonoma County and the Russian River Valley, with a strong emphasis on fine French and Italian wines. “We use a lot of wines that you may not see at the grocery store,” Giannone notes, adding that wines from Napa Valley, South Africa and South America are also available. Plans are in the works to add a device in the bar, located adjacent to the restaurant, that would allow an opened bottle of wine to remain fresh for three months. Giannone plans to stock it with splurge wines that might retail for $250 to $350 a bottle. “That way, guests can buy a glass for $40 to $60 and give it a whirl” without committing to a huge expense, he says. Exceptional service is another goal. “We’re hospitality-forward, meaning we care about the whole experience, not just great food,” Giannone notes. 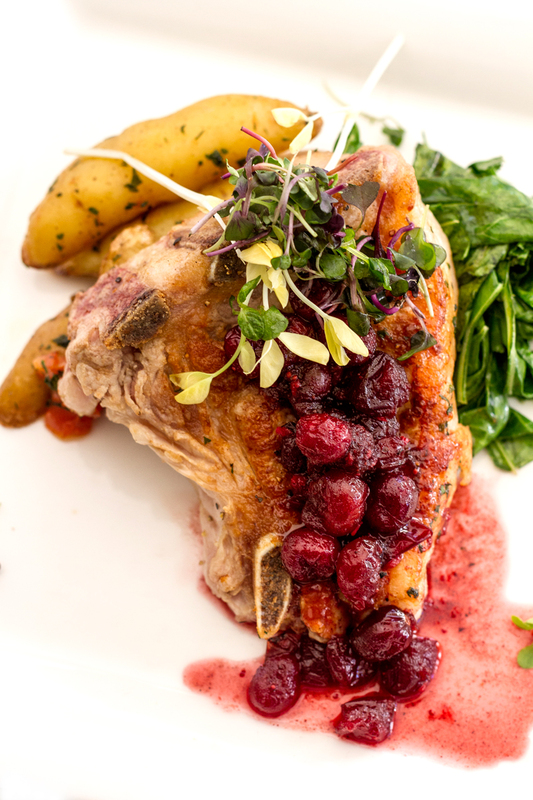 Carnivores will be excited by the meat entrées, including veal porterhouse with pan seared fingerling potatoes, collard greens and a chipotle cranberry sauce. Toward that goal, he and Doyle may bring back tableside elements, perhaps delivering fish cooked in parchment “papillote” then slicing the paper open at the table so guests are treated to the aroma as the scented steam floats above the plate. If you live nearby and need a go-to place, check out Hamilton’s Kitchen again if you haven’t been lately. The same suggestion applies if you’re seeking a special occasion destination. Since the menu is varied and the ambiance relaxed, plus outdoor tables are on a patio secluded from traffic, this restaurant has a lot to offer — even now as it seeks to redefine itself.